Let’s just get this out of the way — coding is the future. Everything is better if you know how to code or design something. Whether it’s learning to make an IFTTT recipe, or making the next big gaming sensation, being able to code is an incredibly valuable skill. What better time to learn such a way of thinking than when you’re a child. Childhood is the perfect time to learn a conventional language, and that same rule applies when dealing with programming languages and coding conventions. Traditional forms of teaching aren’t always the best when dealing with youngsters and a different way of thinking, though. Staring at computer screens deciphering code might be necessary later on during studies, but early on, it can be intimidating to young children. Fortunately, there are various other options that mean kids can understand the logic behind coding, and even design a few things for themselves, without even realizing they’re learning. We take a look at 5 highlights. 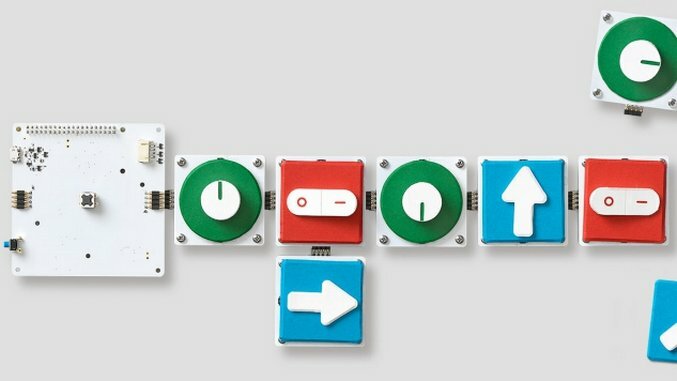 Google’s Project Bloks tackles the foundations of coding by having kids piece together toy blocks to control other toys. It sounds like a quirky take on the subject, but by doing so kids are able to understand the logic behind coding. They soon learn that lining up a bunch of blocks with arrows on them can help direct a robot to follow a certain path, for instance. Other uses involve kids being able to arrange their toy to play music or even jump. Made up of a mixture of electronic boards and programmable pucks, not unlike other building toys, Project Bloks will have your kids learning how to send instructions to other devices in a logical fashion. The best part? They won’t even know they’re learning. Currently in development, Project Bloks looks like it could be one of the most versatile systems out there. Its modular and open source approach ensures there’s plenty of potential here. Microduino mCookie kits can turn your Lego creations into intelligent, miniature computers. If that’s not a huge selling point, we don’t know what is. After all, Lego is already the best building toy out there. Working as a series of stackable electronic modules, you can use Microduino to create anything from an intelligent music box to a quadcopter or weather station. The drag and drop style nature of the coding interface means that young children can get to grips with things just as easily as older kids. The kit comes with Bluetooth, Wi-Fi and GPS capabilities ensuring your only limitation is your imagination. The basic mCookie Kit starts at $99, with the Advanced Kit costing $199 and the Expert Kit priced at $299. Not all coding resources have to cost money. Hopscotch is a free iOS app that gets kids creating games simply by dragging blocks around to formulate ideas. It can potentially take minutes, with users able to quickly share their ideas with others. Backed up by a plethora of simple to understand videos, as well as 40 challenges to develop children’s abilities, it’s a convenient and inexpensive way to learn the basics. The app’s developer promises that kids will soon learn fundamental coding concepts, such as loops, variables, conditionals and abstractions. Learning such basics is an ideal starting point to developing more complex skills in coding. Tynker touts itself as a ‘creative computing platform.’ Its iOS app looks like it fulfills a very similar role to the playground game Hopscotch, but there’s a lot more going on here than first appears. The subscription based service covers many of the most popular bases. Kids can use it to program their Parrot drone, as well as control Sphero robots. Sure to thrill a significant number of kids is the option to mod Minecraft through the service. You can use it to create new skins, but what’s more exciting is the ability to change parts of the game, such as making it constantly daylight or being able to fling fireballs. Alongside such manipulation of popular other products, you can use Tynker to design and build your own games too, with plenty of tutorials for helping you create your own platformer, rhythm game or even a Flappy Bird style experience. Quarterly plans start at $9 a month, with a yearly plan working out at $6 a month. Building a computer is a rites of passage for many tech minded teenagers. Kano is a simpler way of doing it, and when even younger. Based around a Raspberry Pi, Kano is a kit made up of PC components (such as a DIY speaker, and a wireless keyboard), and a picture book that guides children as young as 6 through setting up the PC. Once assembled, Kano can then be used to complete various simple and fun projects, teaching your child how to code, as well as design artwork and create music. The Kano computer kit costs $149.99.